Wigs Direct is your specialist online retailer of wigs. We are proud to offer an extensive selection of wigs and hairpieces. Whether you are looking to buy wigs made from human hair or synthetic hair wigs, we will be able to offer suitable products in a several price ranges. The wigs offered by us have a realistic and lifelike appearance and will delight you everytime you wear them. We ship our wigs worldwide. As a company, we strive toward customer satisfaction. If you have any question about the wigs on offer, please don't hesitate to contact us using the contact form found below. The prices shown are inclusive VAT (19%, Germany) and inclusive shipping. Women seem to increasingly make use of elegant women wigs and hairpieces to follow the latest trend in hairstyles often set by celebrities or to creatively change one's own appearance. Ranging from cool short hair wigs to gorgeous long hair wigs, our sortiment covers a multitude of good quality wigs. Beside being used as fashion wigs, another important field of application is the use of wigs to compensate for the loss of the natural hair because of adverse effects caused by medical treatment. We are looking forward to be able to provide this kind of medical supplies in the near future. For many men, a full head of hair is very important in view of their self esteem. While getting older goes along with loosing the hair or go bald for many males, this is nothing that can 't be concealed with a wig, hairpiece or toupee. Although real hair can't be brought back with those replacements, it can be used for some quite good optical result. 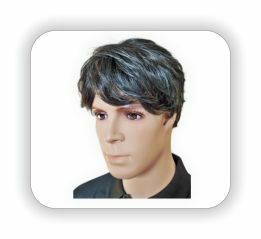 We will offer mens wigs for many circumstances and in different hairstyles, ranging from suitable for everyday use over youthful trendy hairdos to hairstyle for the senior man. Those wigs will probably be able to change your appearance considerably or support you in achieving a new quality of life. 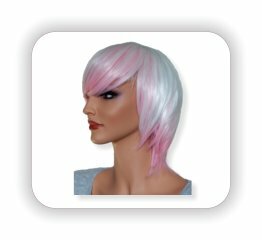 Our product category 'Costume Wigs' includes many products that are suited for a creative costume or disguise. These kind of party wigs are especially well suited for carnival or halloween and are best used to perfect a fancy dress. Other imaginable applications involve using these wigs for Cosplay, Manga or LARP events as well as being used as parts of costumes in a theatre or movie production environment.